George Dillwyn John (circa 1920s). Courageous. Hardworking. Kind. Neighborly. These and many other words describe George Dillwyn John throughout his life, but it is the latter word – neighborly – which is perhaps the most fitting adjective of all. He was, quite simply, one of the good guys – a role model not just for his era, but for today. The John family was a Quaker family of Uwchlan and Shamokin Valley in Pennsylvania…. Abia John (1761-1838) was the son of Griffith John, the older brother of Reuben John. Abia and Martha (John) John moved from Chester County, Pa., to Shamokin Township in Northumberland County. Abia and Martha were both birthright Quakers but were disowned when they married because they were first cousins. They had thirteen children: Asa; Hiram; Emily; Griffith (1795-1856); Reuben; Lydia; Sarah; Jesse J. who married Eliza Hicks; Elida (1805-1883); Samuel; Jehu; Eliza; and Perry…. Elida John (1805-1883) married Sarah Hughes and took over the family farm, and they lived in Shamokin until 1868 when they moved to Illinois to join their children [including former 47th Pennsylvania Volunteer George Dillwyn John and his brother Chalkley John, who became president of the Sterling Gazette Company, publisher of the Sterling Gazette and Farmer’s Gazette newspapers] who had moved there. [Elida] and Sarah raised ten children and joined the Society of Friends at Roaring Creek MM in 1831. He and his brother, Perry, established a meeting at Shamokin, Pa., later known as Bear Gap Meeting. When he moved to Illinois, he was active in establishing Illinois Yearly Meeting. [Abia John] often refused financial aid to his sons, in order to develop with them strong self reliance. At one time, Griffith John, a son, was in dire need, and he made a strong appeal to his father for help. He was made to work out his own destiny and at his death was one of the wealthiest members of the John family, with vast acreage of valuable farm land to his credit. Several of the boys taught school in and about Shamokin (now Ralpho) Township, and they all took active interests in the establishment of schools, not only in Pennsylvania, but in the other States to which they eventually emigrated. We all feel verry [sic] uneasy about Elida. His wife grieves verry [sic] much…. 25th Elida, Perry and Rebecca returned home, to our expressable [sic] Joy, as we feard [sic] he would not return alive or would be verry [sic] disfigured, which was not the case, although he was hurt verry [sic] bad, but with great care and attention, he recovered, to great admiration, and was able to go to meeting the ninth day. His eyes were swelld [sic] shut for three days. George D. John did not have the chance to become acquainted with his grandparents Abia and Martha John, who passed away in 1838 and 1840 respectively, and were interred at the Quaker Cemetery in Catawissa, Columbia County, Pennsylvania. But he did still have an active family life during his early years thanks to his parents, Elida and Sarah John, and siblings: Palemon (1827-1902), Edwin Elida (1829-1910), Martha Ann (1830-1913), Abia Comly (1831-1899), Hugh Lindsay (1833-1918), Ruthanna (1835-1873, Sarah Eliza (1838-1923), Chalkley (1839-1917), and Lydia Emily (1842-1933). [Elida John] was careful that from their infancy his own children should be taught and his wife shared with him in his ambitions for their educational progress. When the free school system was established in Pennsylvania he was elected a member of the first board of school directors in Shamokin township, Northumberland county, and with the other members of the board labored faithfully and untiringly to divide the large wooded, hilly township into suitable districts and to supply each with a competent teacher. He also inspected the building of many schoolhouses erected at that time and for years he frequently visited the schools, speaking words of encouragement to teachers and pupils, arousing their ambition toward greater accomplishments in the line of mental acquirement and reminding the children especially that they were then enjoying privileges richer than their parents ever enjoyed. Scores of young people listened as they had never done to his kind and earnest persuasions to receive wisely the blessings waiting to crown their lives. About 1840, [Elida John] commenced taking an active part in the anti-slavery movement, and speakers who advocated those doctrines and were mobbed for so doing were protected by him. On several occasions his home furnished refuge for escaped slaves, and his house was recognized as a station on the Underground Railroad. He was always an active temperance worker, was a leading member of the Society of Friends, and frequently represented his society in yearly meetings at Philadelphia. Federal census records of the time documented that Elida John’s estate increased in value from $6,000 in 1850 to $11,685 in 1860. Residing at the John’s Shamokin home in 1850 with Elida and Sarah were their children Hugh, Ruthann, Chalkley, Sarah, George, and Lydia, as well as 40-year-old farm hand Henry Lindaman. * Note: Griffith John initially moved from Pennsylvania to Ohio sometime around 1815, and settled in Ross County. 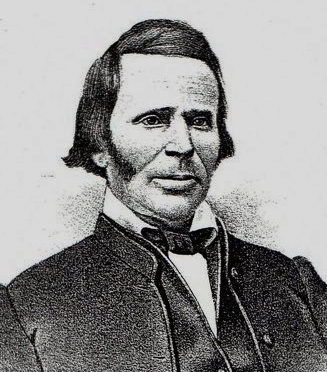 After marrying Rachael Miller, a daughter of George and Mary (Custer) Miller on 20 February 1817, he secured the services of an Indian guide, Jacob Turkeyfoot, to help him relocate his family to Allen County’s wilderness in 1831. As Griffith John prospered, he expanded his real estate holdings from 160 to 1,640 acres. The village of Elida, which he planned and named in honor of his brother in 1852, also thrived, and is now home to the Elida Local Schools. Nephew, George Dillwyn John, met us in Paxinos [Northumberland County] with a carriage, Perry, myself and Wm. Thomas and John Kester. We got safely back home before dark. It was rainy still. We were glad to get home and they to see us. Sarah [George’s mother] was quite poorly. In 1858, George John’s father Elida was elected to a position on the board of directors of Shamokin’s town bank, and helped steer it through reorganization. That September, George’s older sister Ruthanna began a 10-month stint as a teacher in Camden County, Delaware. By 1860, the John’s Shamokin household was smaller with just “Lucy” (aged 25), George and Lydia still living at home with Elida and his wife Sarah. George’s brother Chalkley had moved west in 1859 in search of a better life. 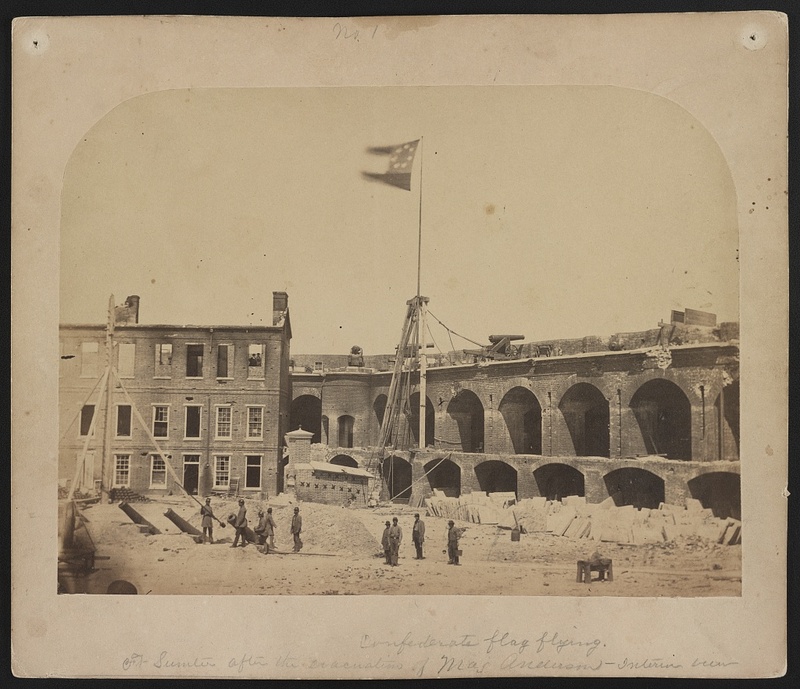 Alma Pelot’s photo showing the Confederate flag flying over Fort Sumter, 16 April 1861 (U.S. Library of Congress, public domain). Saml. and Angalina called here and told that there was war likely to be. 20th & 21st Great excitement. Soldiers inlisting [sic] and starting off in great numbers. Jefferson M. John is gone, among the rest. They started the 22nd for Harrisburg. Dreadful times. We hear of actions of wicked men. Rode with George to their new house. Rain in the afternoon. Frost most every night. Fruit trees in bloom. Change continued to be a constant for the John family during the mid-Civil War years. On 26 August 1862, they said goodbye to George John’s older sister Ruthann, who “started west” with their father and, by 9 September, “got safe to Illinois,” where she then became a teacher. 17th Elida’s went, George, with Jefferson, and Doctor Jesse, and others started as soldiers to Harrisburg. We were verry [sic] much distressed about George agoing [sic]. I went and staid [sic] with M. E. Hughes at Elida’s 2 nights. 10th, the soldiers returned. To our joy, they were not needed…. 21st, Is a rainy afternoon, I was so sleepy in meeting. 27th & 28th, I was verry [sic] unwell with the neuralga [sic] or some soreness and lameness in my breast and arms, and the cold. This brief service of George D., Jefferson M. and Jesse J. John was with Company K of the 36th Pennsylvania Militia (Emergency of 1863). All three were unscathed as Eliza John had indicated – although Jefferson had been wounded in action previously on 13 December 1862 during the Battle of Fredericksburg, Virginia while fighting as a 1st Lieutenant with Company C of the 136th Pennsylvania Volunteers. 23rd, Elida took me to see Doctor Raker concerning a lump in my breast, feared to be a cancer. Both of the Doctors looked at it and gave me no medicine, then we went to Sunbury to Packers and was kindly entertained by Rachel and her children. There was a great Union meeting in Sunbury, the like I never saw before. We were late getting home. Judge Kelly from Philadelphia, and Judge Adams, from Kentucky, and General Coffee spoke. I felt sad that day. 10th mo., 3rd, Willie took me to Dr. J. Rakers. We waited 4 hours but did not see them, the Doctors. We got our dinners. The Doctor appointed for me to come in ten days, but took the day before for the 10th day. 5th, We went again and saw Henry Morris, the young doctor. We came back to Samuel Kellys for dinner. They were very kind, or Anna was. He was not at home…. 14th, Monthly meeting at Cattawissa [sic]. Sarah nor myself was well enough for me to go…. How bad we felt that day. I had sharp stiches [sic] in my breast. Next day, the 15th, Griffith took me to Doctor Rakers … found the old Doctor, but he was a good deal discouraged, and so was I. 26th, Elia took me, being the 5th time I was at Rakers. A verry [sic] cold, frosty morning. I started without my breakfast at 5 oclock [sic], and got to the Doctors 20 minutes ahead of nine. We soon came home. I wanted to settle with the Dr., but Elida wanted him to try something stronger 10 or 15 days longer. But my mind was to quit there, for he did not seem to do much good, and wanted to amputate. He had gave [sic] me 3 phials of drops to take inwardly, and three boxes of salve, or 2 of Iodine, and she gave me a small box of healing salve, and the last time he gave me something to bathe my breast to make it sore. We went to Sunbury I called at R. B. Packers and dined at John Frys. The wife and daughter was verry [sic] kind. We was [sic] late getting home. 11th month 1st, Samuel and wife, Kerseys here. 3rd & 4th, Wrote to Lydia Longstreth, the 2nd letter. Rebecca and I wrote to her 2 weeks before and got an answer. Sarah is verry bad for several days with the Phthisick. 8th, she is still poorly. 5th, I commenced using a poltice of carrot and slippery Elm, recommended by Doctor J.W. Moore to Perry at Baltimore. I have had great deal of trouble to know what is best to do. Sometimes I want to go to Dr. Thayer at Montrose, and sometimes I conclude to go to Doctor Pancoast in the City, and then the monstrous expense and many other things discourages me, and all seemed dark, and then sometimes I felt like going there, and expected to go the 15 or 17, that is, tomorrow or next day. But hearing of the uncertainty of an operation, or using a knife for cancers, sickens me. Perry came home the 19th, Rebecca and Asa went to Berwick. Perry met them. M.E. Hughes has a daughter. 15th, I staid at home today, not being well. I have been more ailing this week. 23rd. I am verry sore and aching in my breast and bowels, and weakness. I had my mind made up to go to Montrose. 24, Recieved a letter from T.B. Longstreth inviting me to come there to be Doctored by Dr. Noble and Doctor Ashmeas, which has given me trouble. On 20 December 1863, the voice and pen of George D. John’s aunt Eliza were stilled by a fast-moving cancer; she was laid to rest at the Bear Gap Quaker Cemetery in Bear Gap, Northumberland County, Pennsylvania. Three days after her passing, George John’s older brother, Abia C. John, enrolled for Civil War military service as a Private and Hospital Steward with Company A of the 34th Regiment, Illinois Volunteers. He would go on to survive the war, serving honorably until mustering out on 12 July 1865. Two months later, George Dillwyn John also headed off to war. On 23 February 1864, he enrolled for Civil War military service at a Union Army recruiting depot in Philadelphia’s Frankford neighborhood. He then mustered in there that same day with the 47th Regiment, Pennsylvania Volunteer Infantry as a Private with Company C – the unit responsible for protecting the regimental and American flags. He would serve under Captain John Peter Shindel Gobin, a man who would later command the entire regiment and go on to become a Pennsylvania Senator and Lieutenant Governor. Military records at the time described George D. John as a 23-year-old recruit and farmer residing in Quakertown, Bucks County who was 5 feet 8 inches tall with brown hair, gray eyes and a dark complexion. Joining an already battle-hardened regiment that had sustained a significant number of casualties during the Battle of Pocotaligo, South Carolina (1862), he likely knew he would be challenged by his service, but could not possibly foresee how great his trials and tribulations would be. George Dillwyn John, it turned out, had enlisted with the 47th just in time to make history. 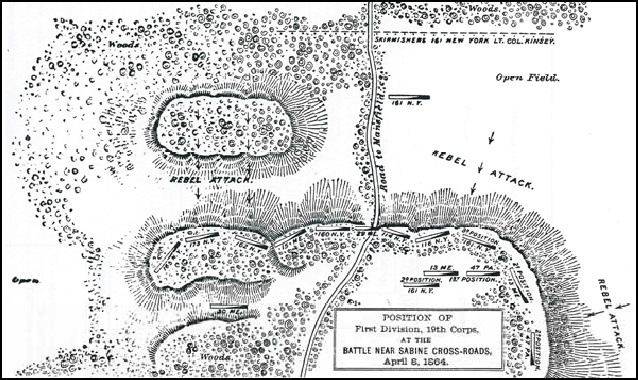 Battle of Sabine Cross Roads/Mansfield, Louisiana, 8 April 1864 (Frank Leslie’s Illustrated Newspaper, 14 May 1864, public domain). On 25 February 1864, the 47th Pennsylvania Volunteers departed from New Orleans, Louisiana aboard the steamer Charles Thomas. Headed for Algiers, they arrived on 28 February, and then moved by train to Brashear City before moving on to Franklin via steamer through the Bayou Teche. There, the 47th joined the 2nd Brigade, 1st Division of the Department of the Gulf’s 19th Army Corps, and became the only Pennsylvania regiment to serve in the Red River Campaign of Major-General Nathaniel P. Banks. 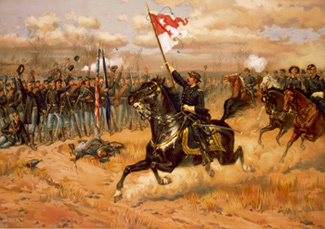 It is not currently known by researchers whether Private George D. John was able to connect with his regiment in time for this early portion of the journey, but he likely was with the 47th Pennsylvania for at least part of its march from the bottom to the top of the L in the L-shaped state (14-26 March 1864). As they made this trek, the 47th Pennsylvanians passed through New Iberia, Vermillionville, Opelousas, and Washington en route to Alexandria. While stationed near Natchitoches, Louisiana, the 47th Pennsylvania freed several enslaved men – four of whom opted to enlist with the 47th Pennsylvania on 5 April 1864. * Note: These four newly freed men (Aaron, James and John Bullard and Hamilton Blanchard/John Hamilton) joined an already-integrated regiment. In 1862, while stationed in South Carolina, the 47th Pennsylvanians had freed enslaved young black men from Beaufort. All were officially enrolled for service on at Morganza, Louisiana on 20 June 1864. Three days after their arrival in Natchitoches, Private George John and his fellow 47th Pennsylvanians engaged in the fight of their lives at the Battle of Sabine Cross Roads (also known as the Battle of Mansfield). Rushed into combat ahead of other regiments in the 2nd Division, 60 members of the 47th were cut down during the back-and-forth volley of fire. The fighting waned only when darkness fell. Exhausted, the uninjured collapsed beside the gravely wounded. Casualties for the 47th were significant. After midnight, the surviving Union troops withdrew to Pleasant Hill. The next day, two of Private George John’s Company C comrades – Color-Sergeant Benjamin Walls and Sergeant William Pyers – were wounded in action during the Battle of Pleasant Hill, Louisiana. The 47th Pennsylvanians had been ordered into a critically important defensive position at the far right of the Union lines, their right flank spreading up onto a high bluff. By 3 p.m., after enduring a midday charge by the troops of Confederate General Richard Taylor (a plantation owner who was the son of Zachary Taylor, former President of the United States), the brutal fighting still showed no signs of ending. 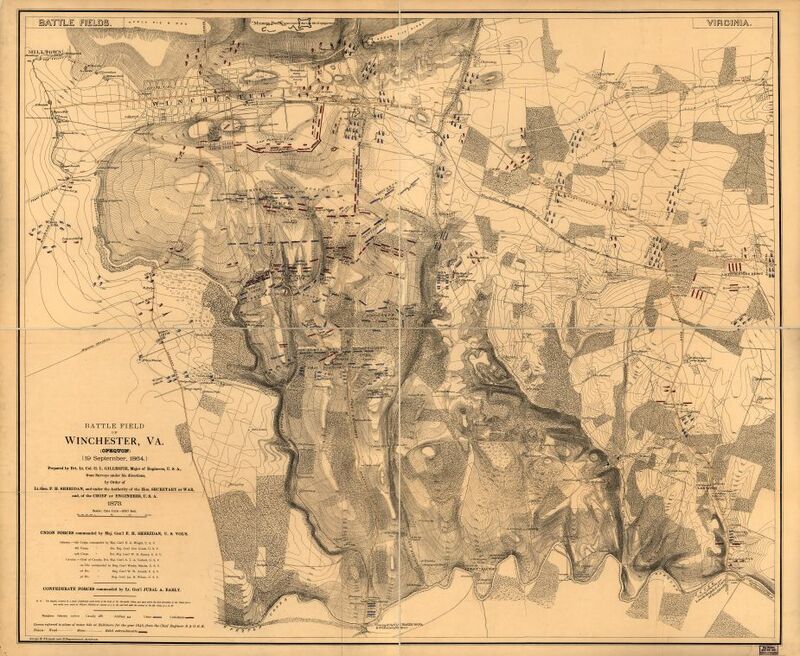 Suddenly, just as the 47th was shifting to the left side of the massed Union forces, the men of the 47th Pennsylvania were forced to bolster the 165th New York’s buckling lines by blocking another Confederate assault. As the 47th Pennsylvania was engaged in recapturing a Massachusetts artillery battery that had been lost during the earlier Confederate assault, Walls was shot in the left shoulder while attempting to mount the regiment’s colors on one of the Union caissons. As he fell, Sergeant William Pyers was then also shot while trying to rescue the flag. Both survived their wounds and continued to fight on, as did the regiment’s second in command, Lieutenant Colonel George Warren Alexander, who was seriously wounded in both legs. Others from the 47th were less fortunate – killed, mortally wounded, or captured by Confederate troops and marched off to Camp Ford, the largest CSA prison camp west of the Mississippi River, where they were held until the prisoner exchanges of July, August and November of 1864. Christened “Bailey’s Dam” for Lt.-Col. Joseph Bailey, the officer overseeing its construction, this timber dam built by the Union Army on the Red River in Alexandria, Louisiana in May 1864 eased the passage of Union gunboats (public domain). 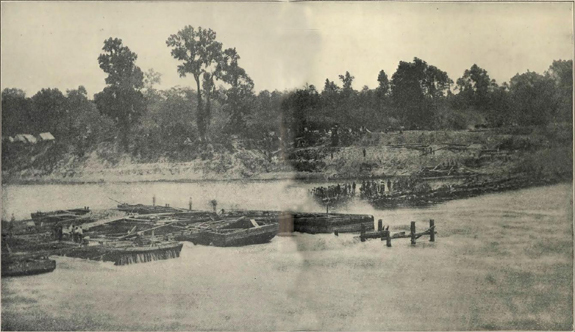 On 23 April, the 47th re-enaged with Taylor’s Confederate troops in the Battle of Cane River near Monett’s Ferry and, from 30 April to 10 May, began building a timber dam across the Red River to enable Union gunboats to travel more easily to and from the mighty Mississippi River. Company C, on last Saturday [21 May 1864] was detailed by the General in command of the Division to take one hundred and eighty-seven prisoners (rebs) to New Orleans. This they done satisfactorily and returned yesterday [28 May 1864] to their regiment, ready for duty. While in the City some of the boys made Captain Gobin quite a handsome present, to show their appreciation of him as an officer gentleman. The boys are well. The 47th Pennsylvania Volunteers then continued on with their march, finally reaching New Orleans on 20 June. On 4 July, the regiment received new orders. Still able and willing to fight after their time in Bayou country, the soldiers of Company C and the men from the 47th Pennsylvania’s Companies A, D, E, F, H, and I steamed for the East Coast aboard the McClellan beginning 7 July 1864. Following their arrival in Virginia and a memorable encounter with President Abraham Lincoln on 12 July, they joined up with Major-General David Hunter’s forces at Snicker’s Gap in mid-July 1864. There, they fought in the Battle of Cool Spring and assisted in defending Washington, D.C. while also helping to drive Confederate troops from Maryland. On 24 July, C Company Captain John Peter Shindel Gobin was promoted from leadership of Company C to the rank of major with the regiment’s central command staff. On 1 September 1864, First Lieutenant Daniel Oyster became Captain of C Company. Four days later, he was wounded in the Battle of Berryville, Virginia. Inflicting heavy casualties during the Battle of Opequan (also known as “Third Winchester”) on 19 September 1864, Sheridan’s gallant blue jackets forced a stunning retreat of Jubal Early’s grays – first to Fisher’s Hill (21-22 September) and then, following a successful early morning flanking attack, to Waynesboro. These impressive Union victories helped Abraham Lincoln secure his second term as President. Once again, there were a significant number of casualties incurred by Union forces – but those casualties would pale in comparison to those that would occur less than a month later. On 19 October 1864, Early’s Confederate forces briefly stunned the Union Army, launching a surprise attack on the Union encampment at Cedar Creek, but Sheridan was able to rally his troops. Intense fighting raged for hours and ranged over a broad swath of Virginia farmland. Weakened by hunger wrought by the Union’s earlier destruction of crops, Early’s army gradually peeled off, one by one, to forage for food while Sheridan’s forces fought on, and won the day. The 47th experienced a total of 176 casualties during the Cedar Creek encounter alone. Among those killed was Sergeant William Pyers, the C Company man who had protected the colors so gallantly at Pleasant Hill just six months earlier. The long list of wounded included Captain Daniel Oyster, who had been shot in his other shoulder, and Private George D. John, who had been struck in the side by a minie ball. Following successful surgery to remove the projectile, Private John convalesced at a Union Army hospital. 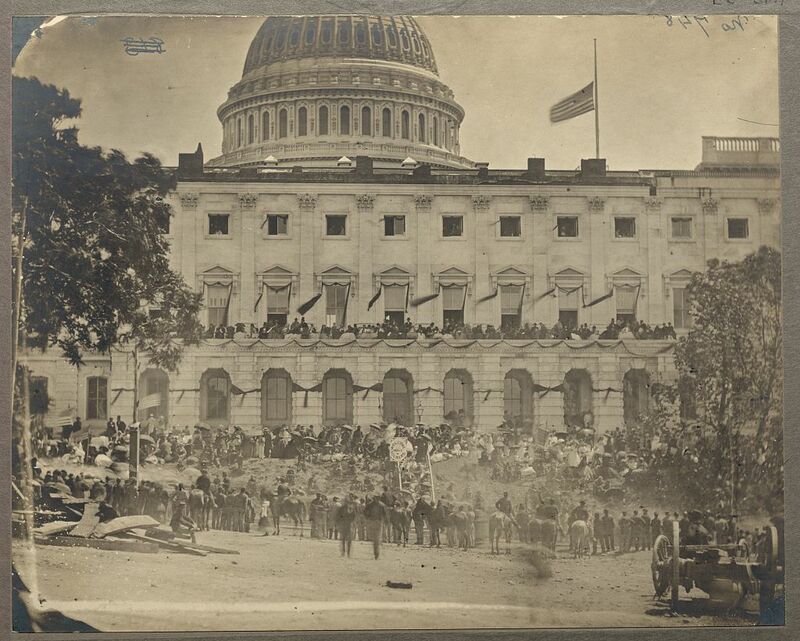 Spectators at the Grand Review of the Armies, 23-24 May 1865; note crepe-draped U.S. Capitol, flag at half mast following the assassination of President Abraham Lincoln (Matthew Brady, U.S. Library of Congress, public domain). 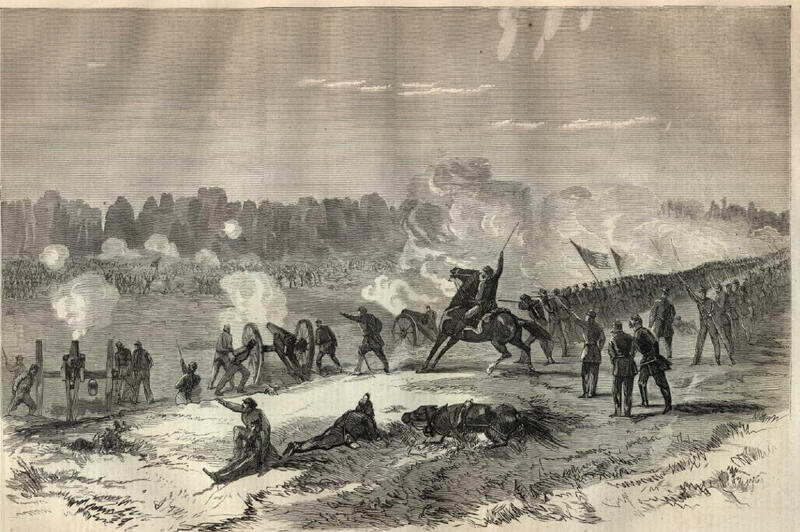 Assigned first to the Provisional Division of the 2nd Brigade of the Army of the Shenandoah in February 1865, the men of the 47th were ordered back to Washington, D.C. 19 April to defend the nation’s capital following President Lincoln’s assassination. Letters home from members of the 47th confirm that at least one member of the regiment was assigned to guard the late President’s funeral train while others from the 47th stood guard at the prison where the key Lincoln assassination conspirators were held. Attached to Dwight’s Division, 2nd Brigade, U.S. Department of Washington’s 22nd Corps, the 47th Pennsylvania Volunteers also participated in the Union’s Grand Review on 23-24 May. Following his honorable discharge from the 47th Pennsylvania Volunteers, George Dillwyn John returned to the pastoral life at his parents’ farm in Northumberland County, Pennsylvania. He then began a family of his own, marrying Mary Alice Miller (1848-1937) in Shamokin on 10 October 1866. A native of Northumberland County who was born near Shamokin on 3 February 1848, she was a daughter of John Miller (1784-1863) and Magdalena Mary Esther (Reed) Miller (1806-1878). On 30 November 1867, the couple greeted the arrival of daughter Margaret Maude John. By 1868, the trio had made their way west, settling in Jordan Township, Whiteside County, Illinois, where George’s brothers Chalkley and Hugh had grown the family’s holdings through the purchase of an additional “160 acres of wild prairie land on section 24,” according to the Chapman Brothers’ sketch. [Elida John] never ceased to feel a deep interest in the world’s progress, in the affairs of government and in all those questions affecting the interests of the individual and the country at large. He was a man firm and fearless in support of his honest convictions [who] became in the course of years a well-informed man, recognized in every community in which he lived as a citizen of intelligence and solid worth. By June 1870, George D. and Mary Alice John were actively building farm and family in Jordan Township, Whiteside County with their children Margaret, Sidney A. and four-month old Adelia Blanche John. Their holdings were valued at $16,300. Also residing at the John home was farm hand Michael Hess, a 13-year-old native of Pennsylvania. Son Clarence was the next to arrive, opening his eyes for the first time in June 1871. Two years later, they then welcomed son Harrison Reynolds. That same year brought sadness, though, when George John’s sister Ruthanna (John) Myers passed away. But joy soon returned as George and Mary Alice John welcomed two more children in quick succession. Daughter Minnie Ada (1874-1973) was born in Sterling on 16 March 1874, followed by son Addison Raymond (1875-1893), who arrived on 10 May 1875. Three months later, George John’s brother Chalkley also became a family man, taking as his bride Anna Nixon on 24 August. Chalkley and Anna John greeted the arrival of their own son – Marius – on 15 February 1877 – just prior to Chalkley’s Spring 1877 election as Road Commissioner. According to the federal census of 1880, the household of George John included his wife and daughters Margaret M., Adelia, Minnie Ada, and Adessa Alma (aged 12, 10, 6, and 1, respectively) and sons Sydney, Clarence, Harrison, and Addison (aged 11, 8, 7, and 5, respectively). The household expanded again when George and Alice John’s son, Elida Palemon (1881-1886) was born on 1 September. Meanwhile, George’s brother Chalkley, who had continued in his capacity as Road Commissioner, was elected as Supervisor of Jordan Township, a post to which he was then repeatedly re-elected. These years of achievement, however, were also filled with moments of loss. In 1883, George John’s father, Elida, passed away, followed by George’s young son, Elida Palemon John, who died on 27 May 1886, and George’s 22-year-old daughter Margaret, who died during childbirth on 10 December 1889. She had only briefly been married to John Baer. Three years later, in 1892, George John then also bid farewell to his mother Sarah. All were interred at the Penrose Friends Cemetery in Penrose, Whiteside County, Illinois. The most senseless loss, however, occurred on 1 December 1893 when George John’s son Addison died after a night of drinking. Out on the town in Sterling with his cousin Marius (son of George John’s brother Chalkley), they were given alcohol by an older friend – William Stauffer – a blacksmith at Penrose. When his friends became too drunk to return to their strict Quaker home, Stauffer left the younger boys in his unheated blacksmith shop. As the temperature continued to drop overnight, they slipped into unconsciousness. Located the next morning by family members, they were transported immediately to a local doctor. Marius survived with frostbitten feet, but Addison succumbed to hypothermia. Stauffer was later arrested and charged for his role in the death of Addison John, who had been laid to rest by his grief stricken family at the Penrose Friends Cemetery. The John family then celebrated another major life event on 9 December 1896 with the union of George and Mary Alice John’s son Harrison and Lizzie Hess, a daughter of Jeremiah Hess and Lydia (Millhouse) Hess, in Monroe, Green County, Wisconsin. 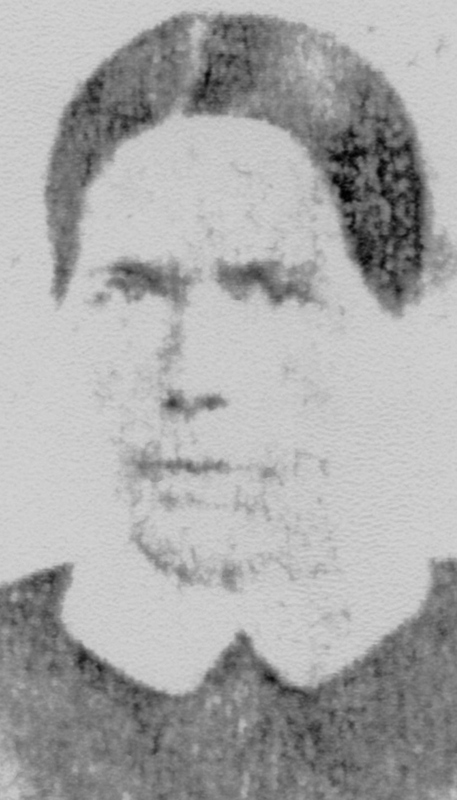 But before the century was over, sadness descended yet again with George John’s brother Abia Comly John died in 1899. George Dillwyn John, his wife Mary Alice, and their family, c. 1920s (used with permission). 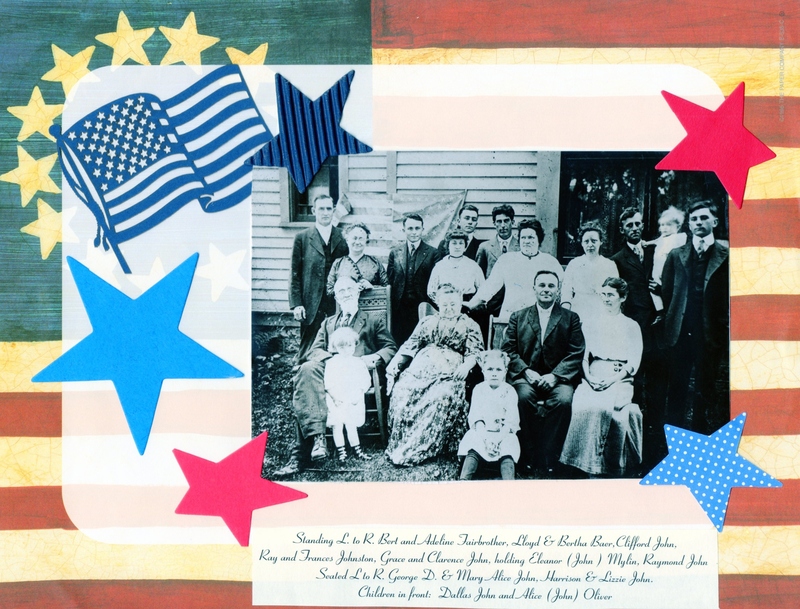 In 1900, federal census records documented that the now-retired George and Mary Alice John resided with their children, Clarence and Minnie, in Sterling’s Ward 2 in Whiteside County. Clarence was employed as a poultry dealer. That each new year with sweet spring-time came. She is now living on a farm on section 23, Jordan township [in Whiteside County, Illinois], which is the old family homestead, but for many years she was closely associated with the educational history of the county and did much to develop the school interests and to promote the intellectual advancement of the communities in which she was employed. She always held to high ideals in her school work, was constantly endeavoring to raise the standard of education and there, are today many in the county who acknowledge their indebtedness to her for her intellectual training and her uplifting influence. …. Beloved by all who know her, her name is mentioned in deepest respect and kindly regard. She has certainly done her life work well, and contributed her full …. She and her brother Chalkley reside upon the old family homestead, which is a farm of one hundred and eleven acres in Jordan township, from which they derive a good income. Chalkley John … has been prominent, active and enterprising in his relations with public interests. He is well known as a former representative of editorial interests, has made a creditable record in official life and has been successful in carrying on general agricultural pursuits… On reaching Whiteside county he found it largely an unbroken prairie district, in which the seeds of civilization and progress had scarcely been planted. He cast in his lot with the early settlers and sought employment on the farm of one hundred and sixty acres which his father had previously secured in Jordan township. He took possession of his father’s claim and began the work of improvement, which he carried on diligently and persistently. Subsequently he purchased one hundred and sixty acres of wild prairie land on section 24, Jordan township, in partnership with his brother, Hugh L. The latter erected necessary building, and the brothers proceeded with the work of development and cultivation. The partnership was maintained for some time, but eventually Chalkley John purchased his brother’s interest. On the 24th of August, 1875, occurred the marriage of Chalkley John and Miss Anna Nixon. Unto them was born one son, Marius, whose birth occurred February 15, 1877. Save for a brief period of a few years, Mr. John has always resided upon the old family homestead, which he operated for his aged mother…. In the ’80s he was editor and manager of the Farm Gazette, published at Sterling, and became the president of the Sterling Gazette Company. He held the office of road commissioner for four years, being elected to the position in the spring of 1877, and on the expiration of his term of service in that office, he was chosen supervisor, in which position he continued for a number of years…. His activities have touched many lines, and all have profited by his labors and wise counsel. The family name has been an honored one in this county for more than a half century, and its present representatives, Martha and Chalkley John, are numbered among the honored and respected people of this section of the state. 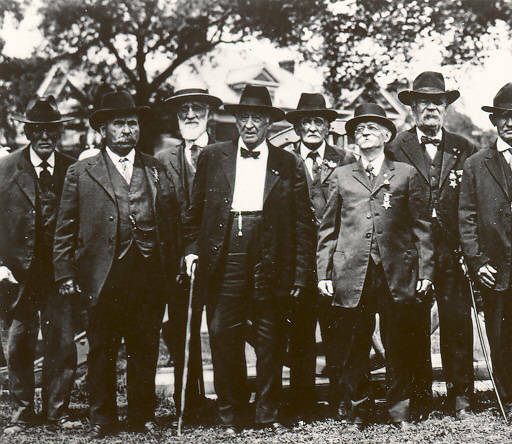 George Dillwyn John (third from left at back), Grand Army of the Republic, Will Robinson Post, c. 1926. The 1910 federal census documented George and Mary Alice John’s continued residency in Sterling, Whiteside County, Illinois in 1910 and 1920. A recipient of a U.S. Civil War pension since at least the early 1880s, George John received steady increases in compensation for his war wound from $6 per month in 1883 to $15 per month in 1910 and $72 per month by 1926, signaling a significant decline in George’s health. Various military records indicate that his health problems likely stemmed from wounds sustained in battle to his side and/or right shoulder. George John’s increasing disability was also confirmed by his 1928 obituary, which noted that he and his wife had made the difficult decision to give up their independence when “they were no longer able to tend to the arduous labor connected with farm life” in order to move in with their daughter Adelia Fairbrother and her family in the Fall of 1927. Less than six months later, George Dillwyn John was gone. * Note: Although another source notes his death as having occurred on 27 February 1928, the obituary of George John which appeared in the 8 March 1928 edition of the Sterling Gazette (the newspaper managed by his brother, Chalkley), George’s death occurred on 3 March 1928. Like his parents before him, George D. John was laid to rest at the Penrose Friends’ Cemetery in Jordan Township, Whiteside County; he was formally interred on 6 March 1928. In early January 1929, a military headstone honoring his Civil War service was shipped to cemetery administrators and placed at his gravesite. While confirming his membership with the 47th Pennsylvania Infantry, it makes no mention of the wounds he sustained at Cedar Creek, Virginia in October 1864. George D. John, son of Elida and Sarah Hughes John, was born in Shamokin, Pa, June 14, 1840, being the ninth of a family of 10 children, of whom Mrs. Lydia E Wilson of Seattle, Washington, is the only surviving member. He passed away at the home of his daughter, Mrs. H. L. Fairbrother on March 3, at 11.25 p. m. Had he lived until June 14, he would have lived 88 years. During his younger days, he spent part of his time teaching school, and when his country needed his services, he enlisted serving until wounded in the battle of Cedar Creek. He was united in marriage to Mary Alice Miller at Shamokin on the tenth day of October, 1865, and together they moved to Illinois, settling on a farm in Jordan township, where they lived until they were no longer able to tend to the arduous labor connected with farm life. They moved to their home located at 307 Sixth avenue, Sterling, where they resided until a year and a half ago at which time they moved in with their daughter. Mrs. Fairbrother, as they were no longer able to manage their own home on account of ill health. In their daughter’s home they were made as comfortable as possible by the loving hands of children and friends. Mr. John was a kind husband, a loving father and a friend to all, ever ready to lend a helping hand wherever opportunity arose. He is survived by his wife and six children, Sydney of Shabbona; Clarence and Harry, of Jordan; Mrs. Adelia Fairbrother, of Sterling; Mrs. Minnie Mayor, of Troy Grove, and Mrs. Adessa Batcheller of Savanna. Four children preceded him in death. Following their marriage [George and Mary Alice John had moved] west and settled on a farm in Jordan township, Whiteside county, where they resided for over 30 years. In 1890, they retired from the farm and moved to Sterling, where at 307 Sixth avenue, they lived for about 35 years, or until physical infirmity made it possible to carry on alone any longer. So they broke up housekeeping and went to live with a daughter and son-in-law, Mr. and Mrs. H. R. Fairbrother, in the east end of Sterling. Here Mr. John passed away on March 3, 1928. Nine years ago, not caring to accompany her daughter to California, Mrs. John decided to make her home with her son Sydney of Shabbona, Ill, where on Wednesday, March 10, 1937, at the age of 89 years, one month, and seven days, she died. Mrs. John was buried beside her husband in the Friends’ cemetery at Penrose on Friday afternoon, March 12. A funeral service was held at her son’s home in Shabbona, while the brief service at the grave was in charge of the Rev. Lawrence N. Main of the East Jordan United Brethren church. To Mary Alice and George D. John were born 10 children, two of whom, Wendell P. and Elida P., died in infancy; two who passed away after reaching young manhood and young womanhood, Addison R. and Margaret, wife of Frank Bayer; Sydney A. of Shabbona; Adella B. [sic], wife of H. L. Fairbrother of Los Angeles, Cal. ; Clarence E. and Harrison R., of Sterling, and Adessa A., wife of Archie Batcheller, of LaCrosse, Wis. Mrs. John is also survived by 18 grandchildren and 18 greatgrandchildren. What Happened to the Other Children of George and Alice John? Like their parents, Adelia and Minnie John both also made their way west. After marrying Iowa native Herbert L. (“Bert”) Fairbrother, Adelia resided with him for a time in Illinois before relocating to Santa Monica, Los Angeles County, California, where Herbert was employed as a carpenter. By 1935, they resided in Los Angeles Township in Los Angeles County, and were still there at the time of the 1940 federal census. Following their respective deaths in 1948 and 1855, Herbert L. and Adelia (John) Fairbrother were then laid to rest at the Riverside Cemetery in Sterling, Whiteside County, Illinois. Minnie wed Dr. Harry Edgar Mayor (1875-1933), a native of Paw Paw, Lee County, Illinois, and relocated with him to Troy Grove, LaSalle County, Illinois. They welcomed son James and daughters Lois and Elma Genevieve. Daughter Elma, who was born on 6 August 1909, took the married surname of Mersheimer, moved with her husband to California, died in Hemet, Riverside County on 23 January 2004, and was interred at the Anaheim Cemetery in Anaheim, Orange County, California. Meanwhile, Minnie (John) Mayor became a widow in 1933 when her husband passed away in Troy Grove, Illinois on 22 May 1933, and was interred at the Wyoming Cemetery in Paw Paw, Lee County. Seven years later, she was a Californian, residing in Long Beach with her 26-year-old daughter Lois (Mayor) Pyffer, and Lois’ two-year-old daughter, Nada, a native of California. * Note: Lois wed and was widowed by James Pyffer, a 22-year-old radioman aboard a U.S. Navy torpedo plane, who was killed instantly on 30 July 1938 when his plane nosedived into the San Diego Harbor after developing mechanical difficulties. His body was recovered and returned to his hometown of New Cumberland, Pennsylvania for burial, according to the 31 July 1938 edition of the Harrisburg Telegraph. After a long, full life, Minnie Ada (John) Mayor died on 23 November 1973 in Long Beach, Los Angeles County, California, and was interred at the Forest Lawn Memorial Park in Long Beach. Adessa Alma John (1879-1959) married fellow Illinois native Archie Bacheller and relocated with her him to Savanna. By 1835, they were residents of LaCrosse, Wisconsin, where he was employed as a locomotive engineer. She died in 1959, and was interred at the Woodlawn Cemetery in LaCrosse, LaCrosse County, Wisconsin. Meanwhile, George and Mary Alice John’s son Sidney and his wife, Ada Theresa, were building a life together closer to home – in Shabbona, DeKalb County, Illinois, where he had become a dairyman. He passed away in Sandwich, DeKalb County on 4 June 1938, and was interred at the Shabbona Grove Cemetery in Shabbona, DeKalb County, Illinois on 7 June 1938. The other sons of George and Mary Alice John – Clarence Emerson and Harrison Reynolds – stayed in Whiteside County, and were interred at the Friends’ Cemetery in Penrose, Whiteside County upon their passing. Clarence made his life with wife Grace Breese (1880-1961), a daughter of Dallas Cassius Breese (1847-1922) and Jane Maria “Jennie” (Quackenbush) Breese (1850-1911), and died on 18 May 1937. Harry went on to wed Lizzie Hess (1879-1956), a daughter of Jeremiah Hess and Lydia (Millhouse) Hess. After raising three children – Clifford Warren John (1897-1985), Raymond Harrison John (1897-1970) and Alice Margaret (John) Oliver (born in 1908) – Harry passed away on 17 July 1940. 2. Bell, Herbert Charles, ed. History of Northumberland County, Pennsylvania, Including Its Aboriginal History; the Colonial and Revolutionary Periods; Early Settlement and Subsequent Growth; Political Organization; Agricultural, Mining, and Manufacturing Interests; Internal Improvements; Religious, Educational, Social, and Military History; Sketches of Its Boroughs, Villages, and Townships; Portraits and Biographies of Pioneers and Representative Citizens, etc., etc. Chicago, Illinois: Brown, Runk & Co., Publishers, 1891. 3. Chalkley John, in Portrait and Biographical Album of Whiteside County, Illinois, Containing Full-Page Portraits and Biographical Sketches of Prominent and Representative Citizens of the County, Together with the Portraits and Biographies of All the Governors of Illinois, and the Presidents of the United States. Chicago, Illinois: Chapman Brothers, 1863. 4. Davis, William W. History of Whiteside County, Illinois from Its Earliest Settlement to 1908: Illustrated, with Biographical Sketches of Some Prominent Citizens of the County, vols. 1 and 2. Chicago, Illinois: Pioneer Publishing Co., 1908. 5. Elida John and Griffith John, in History. Elida, Ohio: Elida Local Schools, retrieved online 23 May 2017. 6. John Family Papers, 1775-1951 (RG5/077). Swarthmore, Pennsylvania: Friends Historical Library of Swarthmore College. 7. John, Clark E. History and Family Record of the “John” Family, 1683 to 1964: The Descendants of John Phillips and Ellen, His Wife, from Haverfordwest, Pembrokeshire, Wales. Salt Lake City, Utah: Genealogical Society of the Church of Latter Day Saints, 1967. 8. John, Don D. and Helen Doup John. Eliza John Diary from 1839 to 1863: An Historical and Genealogical Record of the Quakers in Northumberland County, Pennsylvania and What Befell Them. Louisville, Kentucky: Historical Collections of the John Family in America, 1950. 9. John, George D., Mary Alice John, Elida P. John, Sarah Hughes, and Sidney A. John, in Illinois Deaths and Stillbirths, 1916-1947 (database via Public Board of Health, Archives, Springfield, Illinois, Family History Library microfilm 1,614,419, 1,786,728 and 1,818,801). Salt Lake City, Utah: Family History Library, 1928, 1937, 1938. 10. John, George D., Abia John and Jefferson M. John, in Civil War Veterans’ Card File, 1861-1866 (36th Pennsylvania Militia, Emergency of 1863 and 47th Pennsylvania Volunteers). Harrisburg, Pennsylvania: Pennsylvania State Archives. 11. John, George D., in Pensioners on the Rolls as of January 1, 1883 (per Iowa Senate Resolution, 8 December 1882). Illinois: Illinois Genealogy Trails Group (Whiteside County), retrieved online July 1, 2017. 12. John, George D., in United States Headstone Applications for U.S. Military Veterans, 1925-1949. Washington, D.C.: U.S. National Archives and Records Administration, April 1928. 13. John, George D., in United States Veterans Administration Pension Payment Cards, 1907-1933. Washington, D.C.: U.S. National Archives and Records Administration, 1910-1928. 14. John, Harrison, and Lizzie Hess (marriage record including George John, Alice Miller, Jeremiah Hess and Lydia Millhouse), in Wisconsin, County Marriages, 1836-1911 (database via Wisconsin Historical Society, Madison, Wisconsin and Family History Library microfilm: 1,266,670). Salt Lake City, Utah: Family History Library, 9 December 1896. 15. Obituary (George D. John), in Sterling Daily Gazette. Sterling, Illinois: 8 March 1928. 16. Obituary: Mrs. Mary Alice John, in Sterling Daily Gazette. Sterling, Illinois: 17 March 1937. 17. Payne, Edwin Waters. History of the Thirty-fourth Regiment of Illinois Volunteer Infantry, September 7, 1861-July 12, 1865. Clinton, Iowa: Allen Printing Company, 1903. 18. Private George D. John, 47 Pa Inf, in Illinois Soldier Burial Places, 1774-1974 (database via Burial, Sterling, Whiteside, Illinois, United States, Friends Cemetery, Illinois State Archives, Springfield, Illinois: Family History microfilm: 1,001,192). Salt Lake City, Utah: Family History Library, 1928. 19. Schmidt, Lewis. A Civil War History of the 47th Regiment of Pennsylvania Veteran Volunteers. Allentown, Pennsylvania: Self-published, 1986. 20. U.S. Census. Washington, D.C., Pennsylvania, and Illinois: 1840, 1850, 1860, 1870, 1880, 1900, 1910, 1920, 1930, 1940.